Hello guys, welcome back to this website, in this post we will learn how to mount CO2 (homemade) to aquarium spending little. 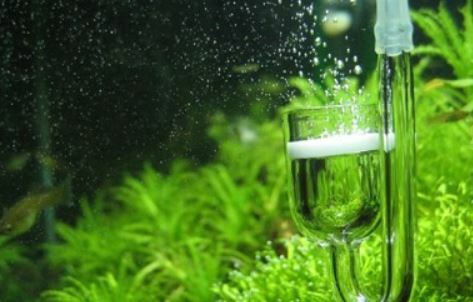 Not everyone has the conditions to purchase CO2 cylinder, learn how to assemble and properly use an extremely simple homemade CO2 injector for your aquarium. On one of the lids, make a hole right in the middle, so that the pin between tightly tightened. In the other, make two holes, one on the other side and place the other two pins. Then use the silicone to glue these pins on the lids of the bottles. You can paste both inside and out, to seal the holes well. Cut 3 pieces of hose, one to connect one bottle to another (some 30 cm), another of a 40 cm to be placed inside the bottle that has the lid with two pins and lastly, a piece that goes from the bottle to the aquarium (this will depend on the height of the aquarium, because the hose should go to the bottom of the aquarium-1.5 m should be sufficient). Let it dry for a few hours. Place a porous stone at the outlet of the hose to make thinner bubbles. • 1.5 liters of water. Dissolve well the yeast in a bit of sugar (in contact with the sugar, the yeast in tablet melts in a few seconds), then add the amount of sugar, bicarbonate, and water. Mix well for a few minutes. Pour into the bottle and close well with the lid of a hole. In the other bottle place 1.5 liters of water and close well with the other lid. The bubbles, in general, take about 1 hour to start coming out. The injector will be producing blisters for about 15 days. The bottle with water is optional, as it will serve to filter something that can come from the bottle with the CO2 mixture. So, in case you didn’t want the bottle with water, the injector will work perfectly with just one bottle. Previous post How do The Fish Sleep?